It’s been a little bit since we officially finished the Whole30 and one of the first things my family requested – aside from fudgy Paleo brownies – was pancakes. 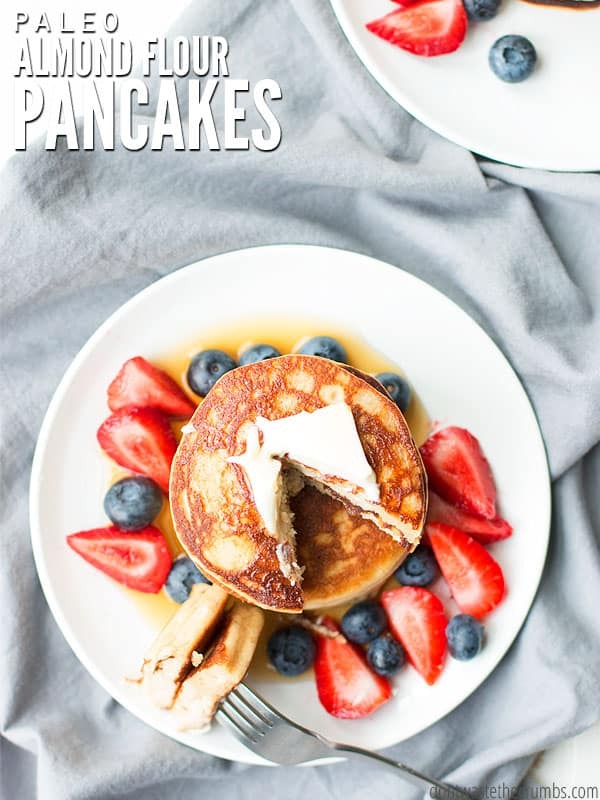 Since Paleo seems to be the non-strict version of Whole30, and I have practically ZERO experience cooking Paleo, I researched Paleo pancakes that I thought my family would like. After several test batches (a few unsuccessful, I might add), we landed on an almond flour pancake recipe that with some of my own frugal tweaking, we absolutely love! Before you even get out a bowl to make these, you should know that just because WE are following a Paleo diet for the current season we’re in, that doesn’t mean YOU have to do it. You can scroll back through my posts and see that we clearly enjoy grains, legumes and dairy. But as we refine how food makes each one of us feel, it’s easier to make us all Paleo for now. While we’re in this season, there are several ingredients that I have in my pantry that I normally wouldn’t have, including almond flour. Sheet Pan Pancakes – uses your favorite recipe, hands-off because they’re baked in the oven! 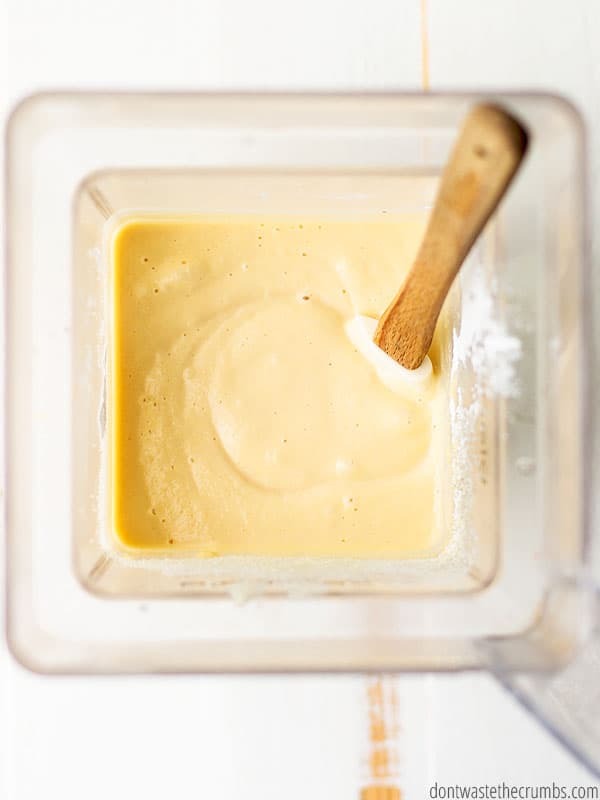 Homemade Bisquick – use this mix and the recipe in the post if you’re used to pancakes from a yellow box! Or if you’re more of a waffle-type of family, my blender cinnamon oatmeal waffles are SOOOOO good. They come out perfect every time and they freeze really well. I always 6x the recipe and save them as a quick breakfast for busy mornings. This should have been a gimme given the name of the recipe, but let’s talk about it anyway. Almond flour really isn’t a milled flour like wheat flour or spelt flour, rather it’s simply finely ground almonds. Some people use the terms “almond flour” and “almond meal” interchangeably, but they’re not the same food. Almond flour is made from blanched almonds which have had the skins removed and is ground more finely. Almond meal is made from almonds that still had the skin and is typically more coarse. I’ve only used almond flour in this recipe, so that’s what I’m going to recommend. If you have almond meal and you give these almond flour pancakes a shot, will you leave a comment and let me know how they turn out? Thanks! I buy almond flour at Costco in bulk, because it’s the cheapest that way at roughly $4/lb. I suggest checking your local warehouse store for the best deal. I’ve purchased this brand at Walmart before and it works just as well, it just costs a little bit more. As I bake with non-grain flours, I’m learning that they don’t work like the flours I’m used to. Using just almond flour in this recipe made pancakes that fell apart when they were flipped, which means we’re pretty much eating blobs of almond flour pancakes rather than cute little rounds. 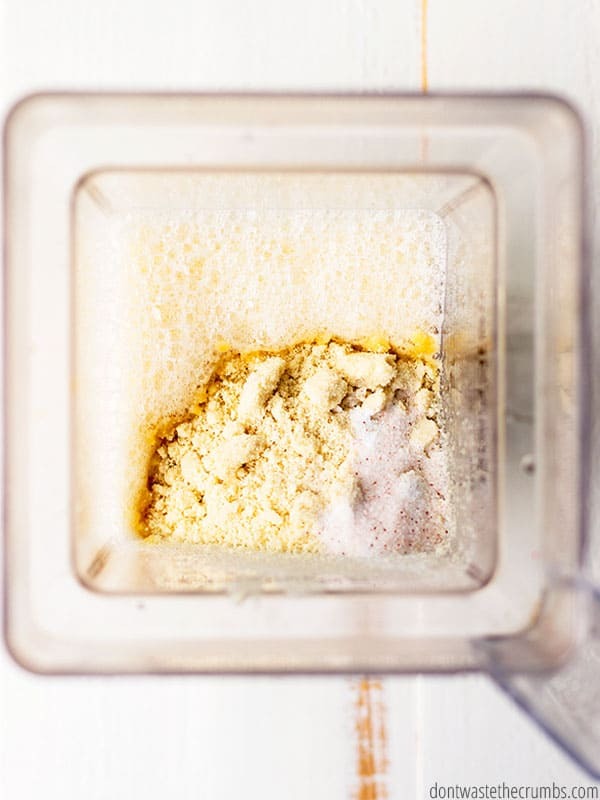 Adding just a teeny bit of another flour – preferably tapioca flour for Paleo – makes them stay together SO much better. If you don’t have tapioca flour, or if you’re not following a Paleo diet (or even if you are for the most part but make exceptions now and then for the budget ← ME), then you can substitute a little bit of oat flour for the tapioca flour. Eggs are purely the binder in this recipe, so if you can’t do eggs, feel free to make flax eggs. I usually have canned coconut milk in the pantry, so when my husband randomly requests that I make no-bake coconut blueberry pie, I can oblige. If you don’t have canned coconut milk, the kind of coconut milk you drink works just as well! With that said, I’m willing to bet that almond milk will work too and therefore, regular milk. I haven’t tested either of these myself, but let me know if you do! The rest of the ingredients are what I call “minor” players, meaning they’re important (obviously) but you have some leeway with them. 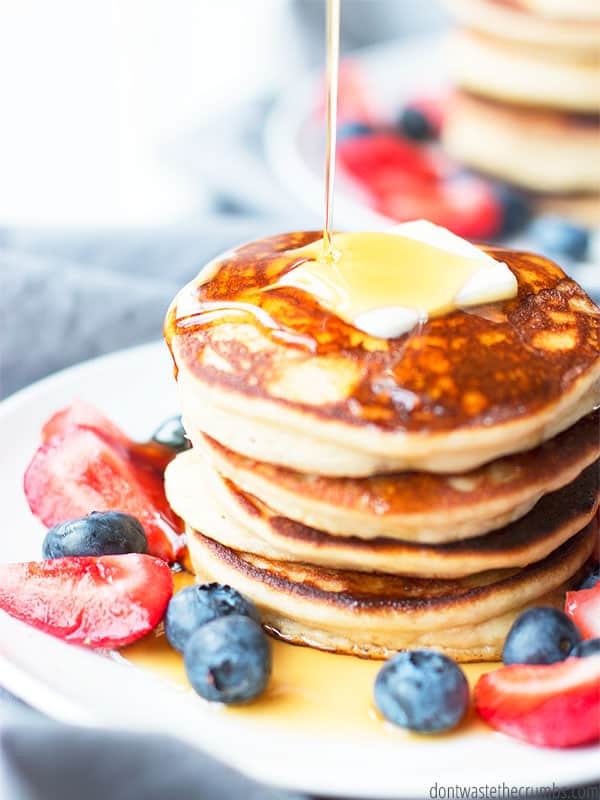 maple syrup: I normally don’t add any sweetener to something my family is going to top with maple syrup anyway, but we all agreed that these almond flour pancakes without the sweetener were just so-so. The recipe doesn’t call for much – just 1 Tbsp for the entire batch – so these pancakes aren’t sweet per se. vanilla extract: I absolutely LOVE the flavor of vanilla (hence my vanilla bean coffee creamer and vanilla bean ice cream), but I don’t usually put vanilla extract in my pancakes or waffles because the cost of vanilla is so high right now. We can make homemade vanilla extract instead, or you can omit it if you’d like. apple cider vinegar & baking soda: Since almond flour doesn’t have any gluten, and therefore no proteins to make it rise, we’re relying on baking soda and an acid to make our almond flour pancakes fluffy. The recipe calls for apple cider vinegar, but you can use lemon juice, whey (if you’re not dairy-free) or white vinegar. butter or coconut oil: These are your choices for cooking fat, so choose whichever you happen to have or can tolerate on your diet. Use your blender. I’ve had a Blendtec blender for several years now and I absolutely LOVE it. I use it almost every day (here are 45 awesome ways to use a blender!) and it has paid for itself time and time again. You can use a regular blender too, but you might have to blend the batter a few times to get it smooth. The batter will be thick. The batter for almond flour pancakes is very thick and almost cake-like. This is normal, and you shouldn’t be afraid and try to thin the batter. You need a preheated skillet. Starting with a skillet that’s preheated and already warm through and through will give you a good ‘sear’ on the one side of the pancake. This will make the flipping easier, and a delicious pancake. If you start with a cool skillet, the pancake will sit and be much harder to flip. Make smaller pancakes. I mentioned before that we’re using a second flour to make the pancakes easier to handle, but making smaller pancakes also helps with this. I use this cookie scoop and use two scoops per pancake and it works perfectly. If you go any larger, know that you might have a hard time getting them to stay together as you flip them. Don’t over-indulge. These pancakes are crazy delicious, but they’re also dense. My husband can easily take out an entire batch of pancakes by himself without blinking an eye, but I’ll warn you like I warned him – the pancakes will catch up to you! They don’t taste rich, but consider them as such when you enjoy them. This will make your tummy happy later in the day. If the pancakes burn quickly… make sure you add a bit more coconut oil or butter. Food burning is a sign that it’s not really cooking. It’s just going from raw to burned because of the direct contact with the skillet. I know that this recipe is a bit more fussy than most of my recipes, but for those who are coming off the Whole30 or following a Paleo diet, you know how much work it takes to properly prepare all of your meals. 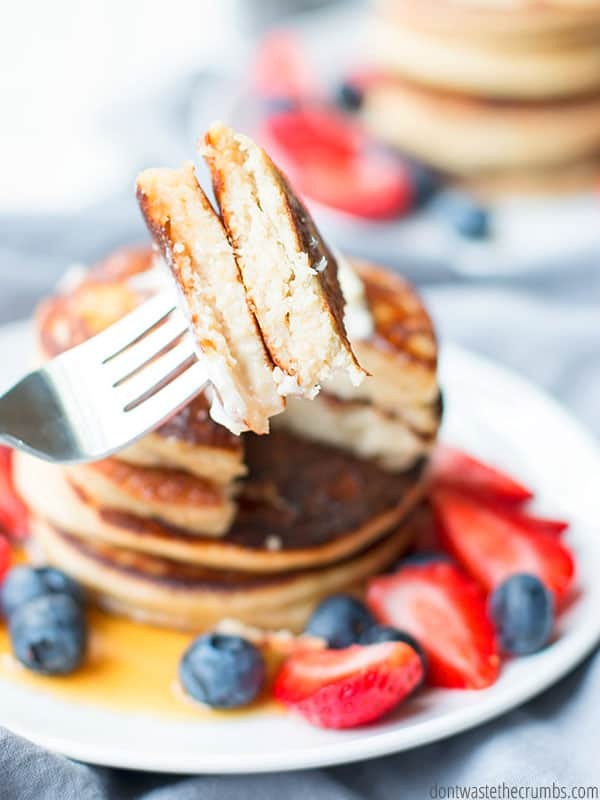 These almond flour pancakes are worth the effort, I promise! To save time, you can mix the dry part of the recipe ahead of time and store it in a glass jar, much like you would for homemade Bisquick, homemade yellow cake mix or homemade chocolate cake mix. Preheat your griddle or cast iron skillet to medium low. In a blender, combine eggs, milk, honey, vanilla and vinegar. Process on low until everything is well combined. Add the remaining dry ingredients - flours, baking soda and salt - and process on high until you have a thick batter, about 30 seconds. When your skillet is hot, add 1 tsp of fat and swirl to coat the pan. Add 2 tablespoons of batter to the skillet and using either a cookie scoop or the back of a spoon, gently spread the batter into a 3" circle. Let the pancake cook for about 1-2 minutes, or until it's golden brown. Carefully flip over and let the second side cook until it's also golden brown, 1-3 minutes. 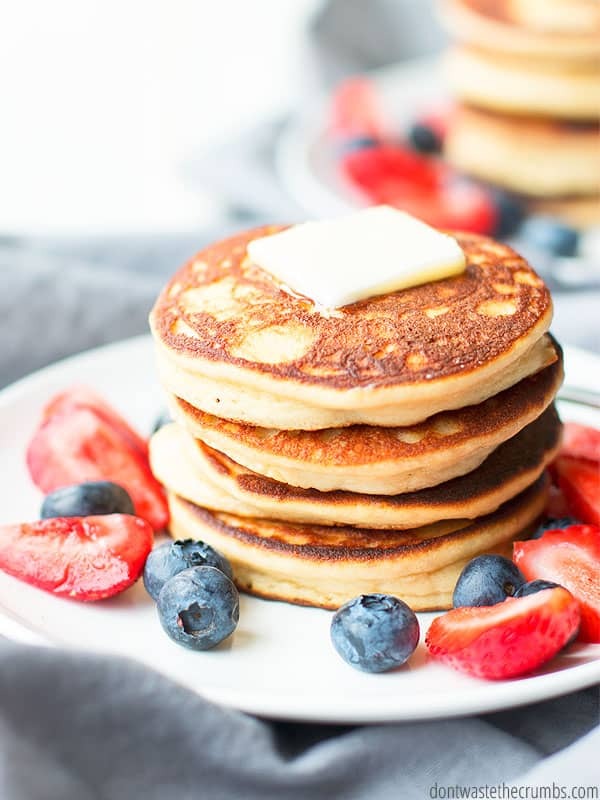 These easy almond flour pancakes are best hot off the griddle, but they store well covered in the fridge and they freeze well too. What’s your favorite type of pancake? Soaked, buttermilk, fluffy, sourdough… plain, spices, fruit… toppings?!?! Tell me all your ideas in the comments below! I’m out of tapioca flour. What are your thoughts on arrowroot powder? I’m newer to baking paleo as well and still can’t find a pancake recipe we all enjoy. Hi Sarah! Arrowroot doesn’t behave the same as tapioca in cooking or baking on many different levels, so I wouldn’t use it. You can omit it in this recipe and use additional almond flour, but you lose the traditional pancake flavor. If I didn’t have tapioca, I’d try coconut flour to be honest! This is my second time making these and I really have enjoyed them! I make a double batch and put them in the freezer because my other family members eat “normal” pancakes. She is right that these are very filling. I put a little all natural peanut butter on top instead of syrup. I’ve also added banana or Lily’s stevia chocolate chips.